George Carlin passed away yesterday. This makes me sad. Carlin was a comedic and linguistic genius as well as a defender--or perhaps practitioner is a better word -- of free speech. 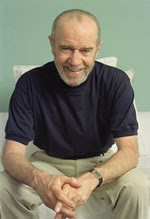 Probably best known for his bit on the seven dirty words, Carlin shocked, but did not need to shock, to be funny. His mind was brilliantly attuned to the absurdities of life, and his gift for language and physical humor allowed him to reflect those absurdities back to us in a way that both challenged and tickled our sensibilities. George Carlin touched me. Literally. In college I was with a group that brought him to Rutgers for a performance . Before the show began I was charged with guarding his dressing room. The door opened and I felt a tap on my shoulder. "Yes Mr. Carlin", I replied. "Right down the hall to the left, Mr. Carlin." Goodbye Mr Carlin, and thanks for all the laughs. Sweet post, Peter. I was in a hot tub with Sam Kinison once when I was 11 or 12. He didn't touch me, though. Thanks Caleb. When I see you at ALA I want the details on how you wound up in a hot tub with Sam Kinison!